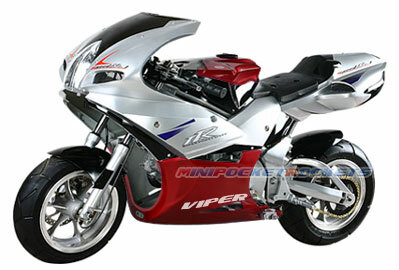 The heart of the R32 Viper Super Pocket Bike is its Race-Tuned Honda®-Based 110cc 4-Stroke Engine. 4-Stroke motors are more powerful and responsive through the entire RPM range than their 2-stroke counterparts. This means faster acceleration and the highest top speeds allowed for pocket bikes this size! The exhaust note is also unlike any you have ever heard. Idling with a deep rumble, the throaty performance dual pipe sings a tune reminiscent of a full size GP Moto all the way up to its redline, topping out at over 70 mph! Handling is kept tight and responsive thanks to its race-proven R32 CAD tubular frame. Increased lateral stiffness ensures the rider the quickest side-to-side transitions possible in a super pocket bike. Race-proven dual hydraulic brakes on both the front and rear further gives the rider the confidence to be the last one getting on the brakes deep before a corner. The race-tuned suspension is infinitely adjustable to match any rider and any track condition. Equipped with a real left-hand clutch and a 4-speed Sequential Manual Gearbox (gear selection digitally displayed on dash), the rider has 100% control over every aspect of this super pocket bike. We also offer the R32 Viper with options for a Semi-Manual Transmission (no clutch, only foot shifter) or a Fully Automatic version (no clutch or shifting) that has been calibrated to match the high performance output of the manual-shifted version. It's your choice! The R32 Viper is decked out with features and comes fully assembled. The electric starter is activated by a push of a button. A set of unique keys are also included as an anti-theft mechanism. The ZR motorcycle alternator keeps the battery constantly charged. Collapsible foot pegs, heavily padded seat and adjustable angle/height handlebars and brake/clutch lever will give every individual racer a customized fit. The illuminated dash display includes a 70 mph speedometer, battery level gauge, warning lights, and a digital LCD gear selection readout for day or night viewing. To top off the performance advantage, the R32 Viper super pocket bike comes pre-installed with a high-flow racing intake system, a dual pipe race exhaust system and a tuned progressive rate racing spring (refer to the huge yellow spring in the pictures!). These free race-prepped upgrades (a $200 value) along with the superior technology put into this new generation R32 Viper will guarantee faster acceleration, shorter braking, better handling and higher top speeds than your competition. Included Free with 4-Stroke Super Pocket Bike: Individual Keys (2), Tools (sockets, screwdrivers, allen wrenches), Tool Case, Spare Fuses, Owner's Manual / Certificate and our free extended warranty.